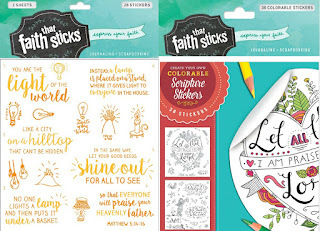 Books, Bargains, Blessings: Bible Journaling and Scrapbook Stickers from Faith That Sticks! 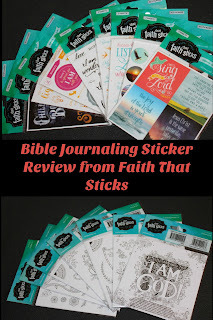 Bible Journaling and Scrapbook Stickers from Faith That Sticks! FTC disclaimer: This post contains affiliate links. I received samples of the products from the company for review purposes. All opinions are my own. I have been a sticker fan since I was a child. I can remember counting my stickers by the hour to see how many I had in my collection. So whenever there is a new sticker product on the market, I want to try it. I've tried my hand at Bible journaling, and while I love the creativeness of it, my art skill are somewhat lacking. I often stick to coloring Bibles or when I do Bible journaling, just doing fancy lettering of the Scripture in the margins. 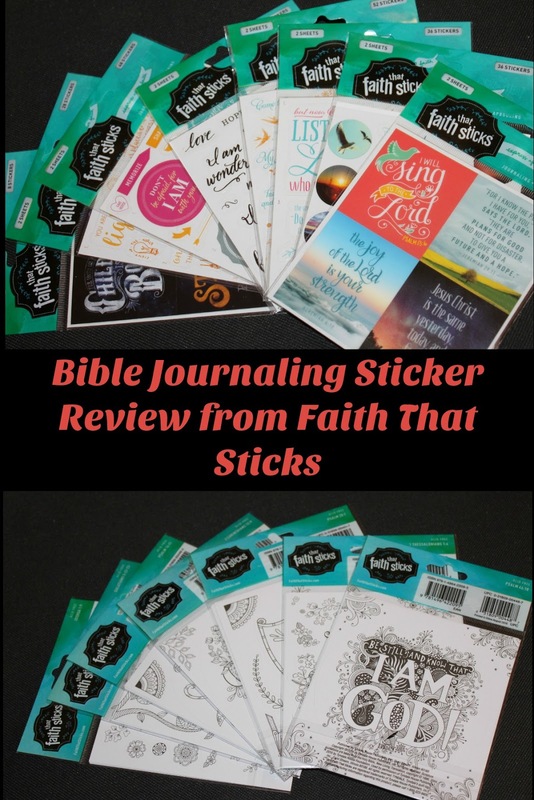 Thanks to Tyndale House Publishers and Faith that Sticks, I had the opportunity to review their coloring stickers and Bible journaling stickers. Here's the quick version: They are stickers, therefore what's not to love? (I've never met a sticker I didn't like!) 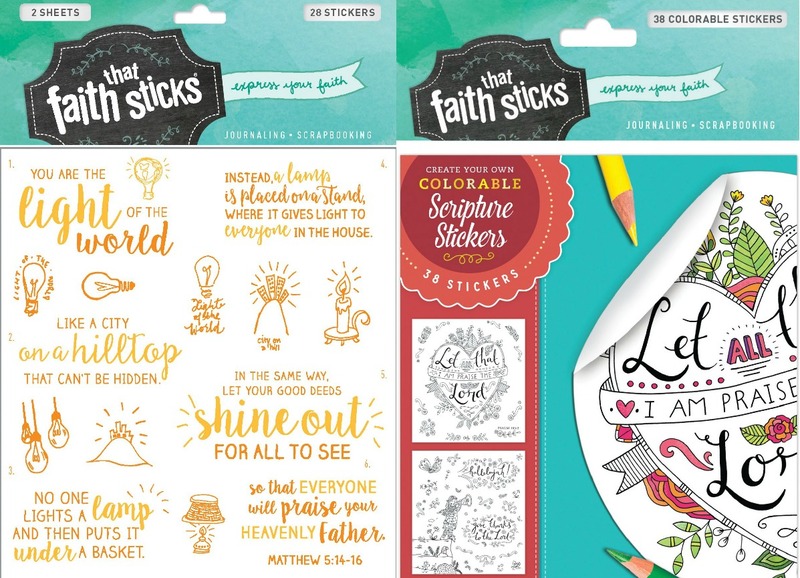 I loved all the different types of the stickers as there are both ones you can color or use as is right in your Bible (or other place where you might want to "stick your faith"). I enjoyed the different varieties. Of the pre-printed varieties, there were two that have regular 1 7/8 by 2 1/8 stickers on the sheets. I was hopeful these could be used as stickers within my MAMBI Planner, which is the same size as the Erin Condren, but the stickers were too wide. (I'm not picky with my planner stickers and still put a few in my planner as I will enjoy seeing the Bible verses in the future. I even put one on the day the family reunion is set to start, as we all can use extra encouragement when around in-laws, right? Ha ha!) The other packs were varied in size and shape. My favorite pack had an entire Bible verse in four stickers. (You can see how I did a simple page with those in my Bible. I will go back and color around them, but my coloring is more for my enjoyment than anyone else's. I mean, I'm the one whose kindergarten teacher requested a conference with my parents over my lack of coloring skills. 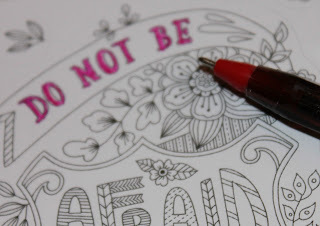 LOL I love to color, but don't want my coloring to distract from the product.) Also, on this package there were stickers that I loved with arrows that said "Memorize", "Share", "Obey", and "Life Verse". I liked how these were transparent and so beautiful when placed within my Bible. What I didn't like was something that won't bother most people: They were not in the King James Version. I have a preference towards that version because although I am no Rembrant, I do hope my journaling and coloring Bibles become a family heirloom. Different versions come and go, but the King James seems to be the standard that everyone can agree on. Therefore when I was buying a journaling Bible, I purposely bought a King James Version. I also appreciated the fact these stickers are acid free. I have been hesitant to use other stickers in my Bible because I don't know if they are acid free or not, but with these I don't have to worry about them -- I know they are. The pre-printed stickers range from 8 stickers in a pack to 52 in a pack. (Two identical sheets.) The stickers you color range from 20 sticker (10 per sheet) to 64 in a pack. The coloring stickers have *different* sheets in each package. The coloring stickers are beautiful. I like them - except for the fact I believe the designers made these much larger and shrunk them to fit the sticker size. For that reason, I find them somewhat difficult to use. I had to use ultra fine point ballpoint pens (0.7mm pen tip) to color these and even then I found some of the areas a little small to try and color. For someone who likes to color but isn't that great with it, these were not my favorite stickers to try and use -- but for someone more artsy, they would be great. I hope in the future that they decide to make less intricate designs that can be colored with more than just the finest of pens. These would make GREAT stocking stuffers for anyone who loves Bible journaling, children (although you might want to skip on the coloring stickers as those might frustrate children as they try to stay in the lines), or anyone who loves to journal. I wish I could add those who love planners on this list, but as I mentioned above, the stickers are just too big to fit snugly within a section. These would also make a great white elephant gift at a ladies' meeting because they have so many possible uses -- the coloring ones could be used to create greeting cards as well! 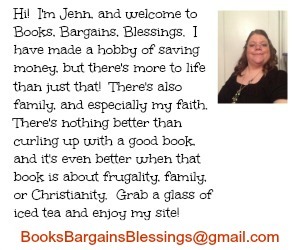 Another fantastic idea is these are only $2.99 a package, and they would be an excellent item to add to your Amazon or Christian Book cart if you are just a couple dollars short of the free shipping threshold! And now for the giveaway. One winner will receive FIFTEEN packages of stickers from Faith that Sticks. Must be 18 or older and live in the USA. Winner has 48 hours to respond to winning e-mail or another winner may be chosen.